TCL was in the spotlight of CES 2019 when the conglomerate announced alcatel 1x (2019), some BlackBerry updates and introduced the flexible panel prototypes of its subsidiary CSOT. The company will be part of MWC as well, and we expect to see half a dozen new phones, according to a leak by Evan Blass. All of them appear to have affordable specs, with the mightiest of them - alcatel 3, coming with a Snapdragon 450 chipset. Starting from the bottom, an affordable choice would be the alcatel 1S with its Unisoc SC9863A chipset by Spreadtrum. It has eight Cortex-A55 CPU cores, clocked at 1.6 GHz. We see two cameras on the back (13 MP + 5 MP), and the image also reveals 3/32 GB memory. The battery will be 3,060 mAh, and the phone will run Android Pie out of the box. 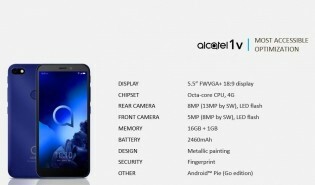 There is an even cheaper option, called alcatel 1V. You get a similar 5.5” screen, but memory is 1/16 GB, there is one 8 MP camera on the back and a 2,460 mAh battery. The 1V will be the Android Go phone since it will have Oreo (Go Edition) out of the box. 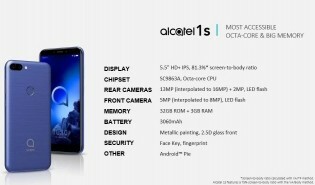 A slightly higher series is the alcatel 3 devices. 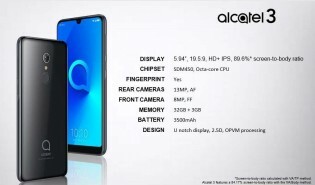 The one with a “teeny notch” on the 5.9” display and “tiny price” is called alcatel 3L with dual cameras and a Snapdragon 429 with a quad-core CPU. The battery will be 3,500 mAh, and the phone will ship with Android Oreo, but an upgrade to Pie is said to be in the pipeline. The alcatel 3C is a bigger handset in size but isn’t anywhere as impressive as the 3L. The maker is likely going for a big multimedia smartphone with basic specs for a low price. 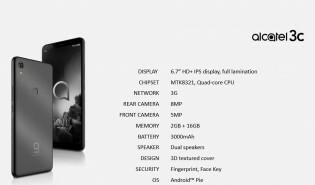 We see a 6.7” HD+ screen, 2 GB RAM and Mediatek MT8321 chipset, seen mostly in tablets. The device has dual speakers and will ship with Android Pie out of the box. 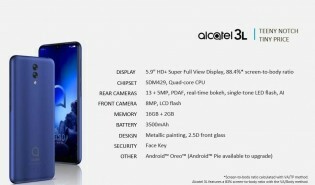 Another huge phone is the alcatel 3V, which has the same name as the alcatel 3v from last year, also seen at the Fira Gran Via in Barcelona. 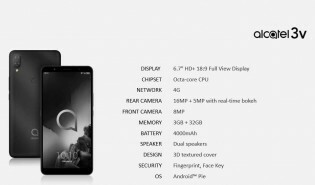 The 2019 iteration has a 6.7” Full HD+ panel and octa-core CPU, but the leak does not say which chipset the device will run. The dual 16 MP + 5 Mp cameras will provide real-time bokeh effects for portrait photos, while this whole setup will be running on a 4,000 mAh power cell. And now the star of the show - alcatel 3. This one name is also familiar from MWC 2018, but here's where the similarities end. The manufacturer is bringing a U notch on the 5.94” panel with HD+ resolution and an extremely tall ratio of 19.5:9. There is a Snapdragon 450 chipset on the inside of the alcatel 3, coupled with 3 GB RAM and 32 GB storage. One 13 MP camera on the back has a fingerprint scanner to keep it company, while the selfie shooter in the notch is 8 MP. We will be at MWC for all the coverage, and once we know more specs, pricing, and availability, we’ll let you know, so stay around. Thanks Yordan for this info, we'll keep our fingers crossed for the price. that alcatel should have a FHD resolution. Well, let's see it on MWC.